The north-east corner of Sardinia was almost unknown until the 1960s when the Aga Khan came here and began to develop luxury hotels. Now almost everyone associates Sardinia with the Costa Smeralda, Porto Cervo, super yachts and celebrities. 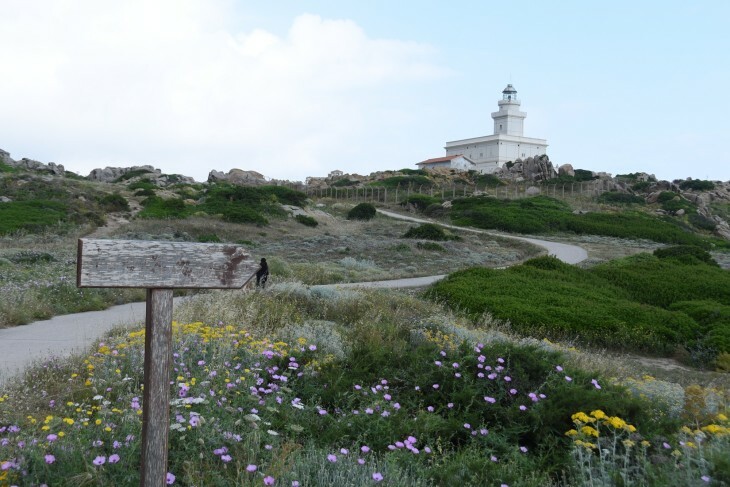 But there’s another side to the Gallura region. Indeed much of it remains wild and uncultivated and the sea is famed for its crystalline beauty. This photo essay was made during my recent stay at Valle dell’Erica, a resort set in 28-hectares of scented shrub-land fronting the pristine waters of Licciola beach, and at the Hotel Capo D’Orso, a second spa resort in the Delphina portfolio. I wanted to concentrate on the plantings because they are very important part of the ecological programme that Delfina are promoting. 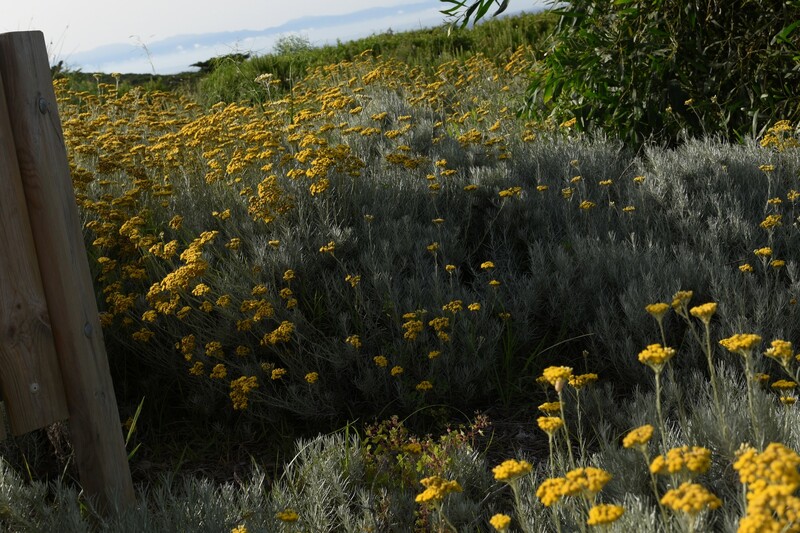 Natural plantings throughout the resorts help ensure the buildings blend with the environment and reduce the need for water – and pesticides. Colourful and aromatic Lantana (above) are very widespread. 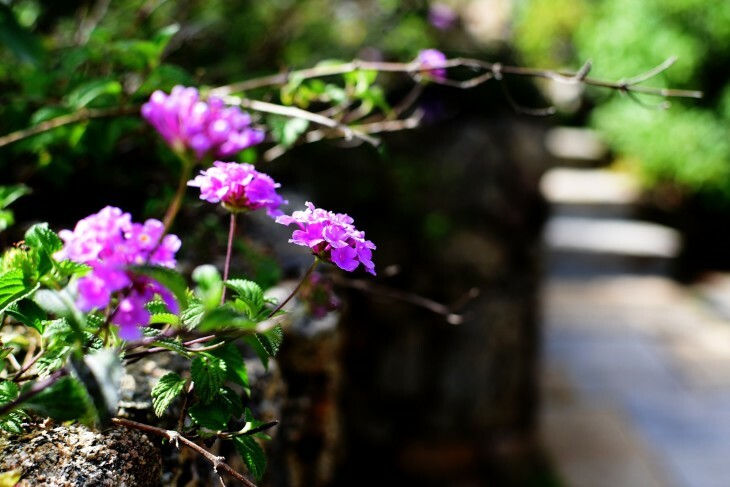 Gardening staff maintain the paths and walkways and keep the resorts spotless because even indigenous shrubs need to be controlled. Both Valle d’Erica and Capo d’Orso have only salt water pools which are discretely set amid the groves. Insect friendly plants are abundant. 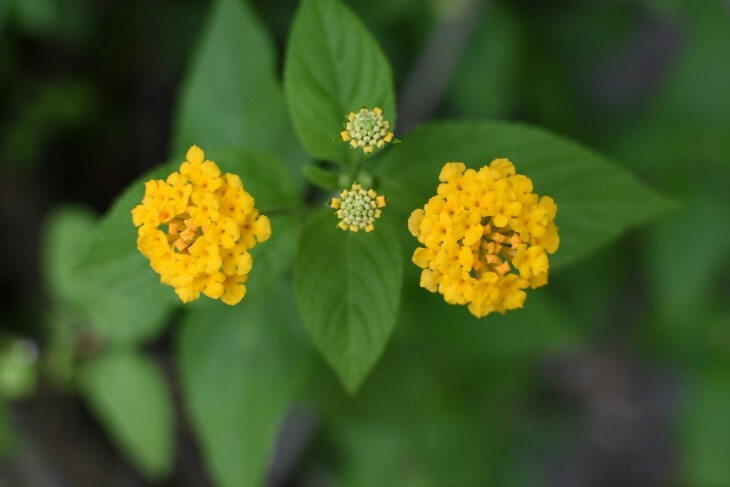 Lantana, such as the purple variety above, are particularly recommended and are a staple of butterfly gardens. The so-called Curry plant or Helichrysum italicum is grown widely on both resorts and has a strong aroma that is not to everyone’s taste but it can be used in cuisine. 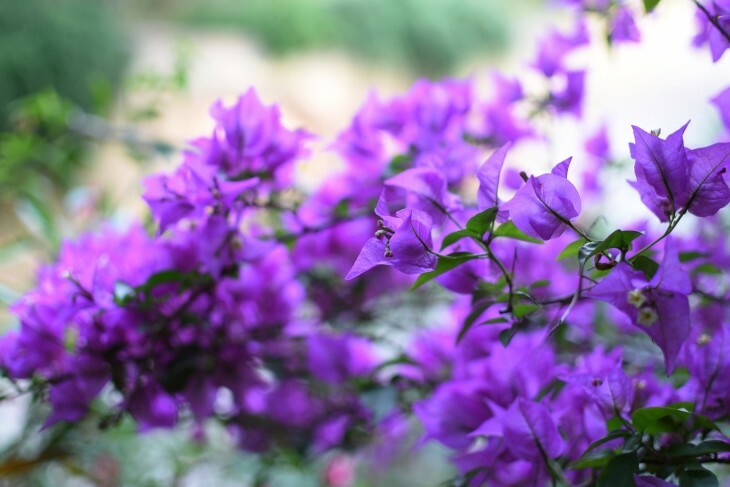 Bougainvillea: not my favorite plant but striking and colourful. The flower itself is generally small and white and what you think are the flowers are bracts or modified leaves that are thin and papery and give the plant its common name Paper Flower. 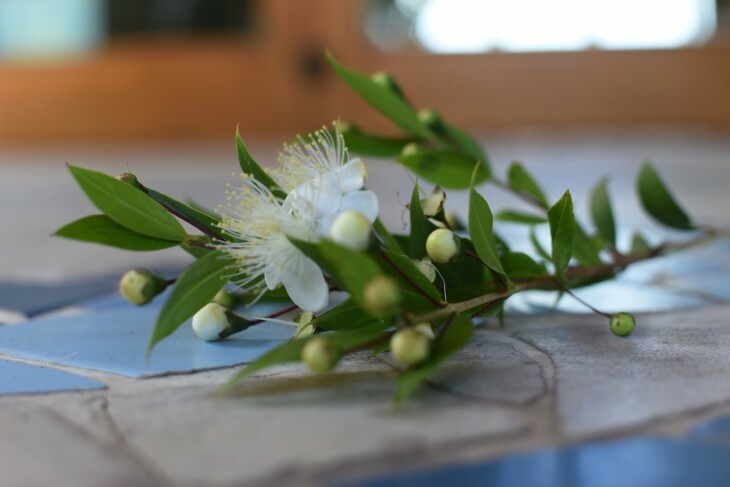 Myrtus communis, the common myrtle is one of the most abundant shrubs at Valle d’Erica and Capo d’Orso.It is native to the Mediterranean and can grow to 15ft. The star like flowers have delicate stamens and are usually white. The berries are used in cuisine and also on Sardinia to make Mirto, an aromatic liqueur. Myrtle is associated with Venus and love, and it is said to bring romance to those who plant a bush in the garden. 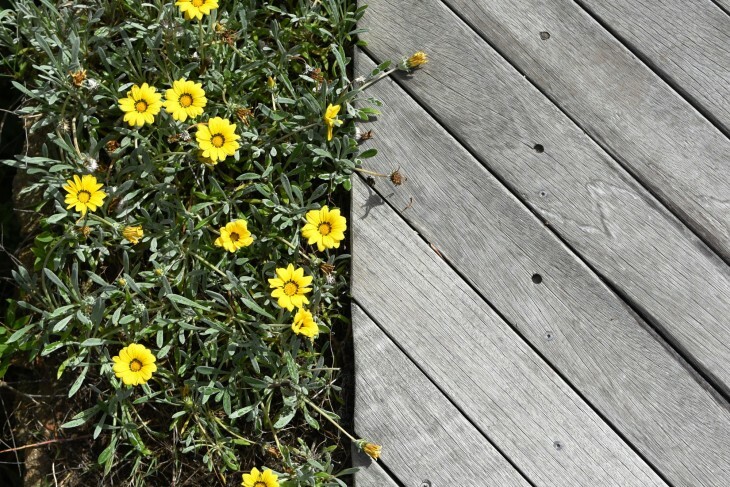 Medicinally, myrtle was traditionally prescribed for pain and fever. One of the secrets of a healthy plant environment – lots of rain – although this storm was unusual for June. 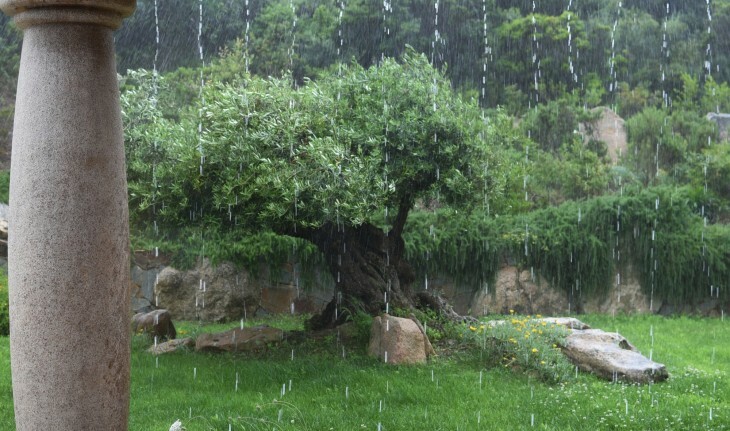 Staff told me that in the past three years the weather in Sardinia has become noticeably more temperamental. Another of the secrets of health, great food. Sardinia has one of the world’s only Blue Zones (there are just three others) – a collection of villages where exceptional longevity has been recorded. Some Sardinians claim it is due to their pecorino cheese and red wine. I’ll buy that. My absolute favorite restaurant at Valle d’Erica was Il Grecale but all the food was of a very high standard and fabulously healthy. 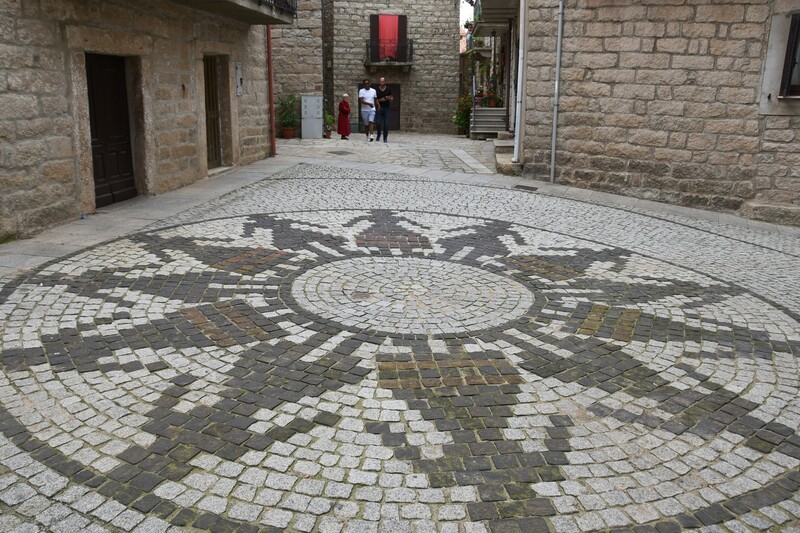 The village of Aggius is known for its painted houses and tile patterned streets. We spent some time in the small Textile Museum where you will see the traditional weaving technique and examples of looms. Many designs are similar to the rugs and flatweaves of north Africa and the Middle East but there is a tradition that is peculiar to Sardinia – where raised bumps of thread, called pibiones, or grape seeds, make the pattern, with the weaver inserting the pibiones according to pre-made patterns of flowers, fruits and animals. With thousands of cycle routes to explore on Sardinia, cycling is very popular but most routes are strenuous and hilly. 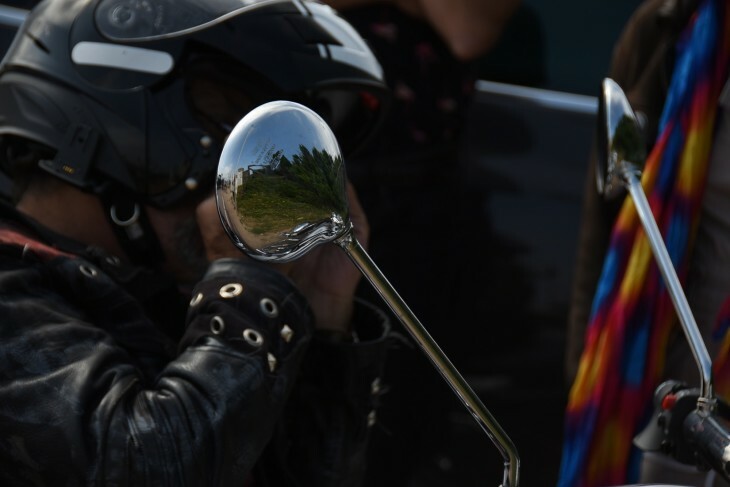 The alternative is to take to a motorbike or even a trike as this party (mounted on £50,000 Harley-Davidsons) were doing. 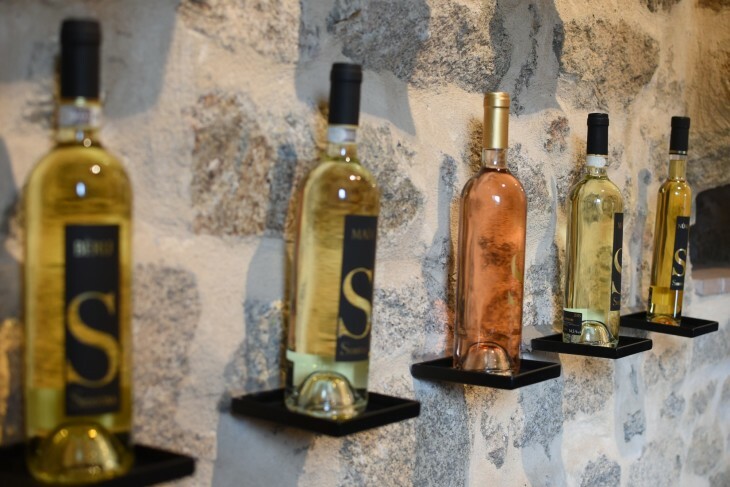 Delphina have a partnership with the Siddura Winery, built just 20 years ago as part of a programme to improve the quality of Sardinian wine. Situated near the medieval, village of Luogosanto, in the heart of Gallura, it is an hour’s drive from the resort. Limited yields and hand production ensure wines of elegance and quality. Enjoy a tour and wine tasting in the small stone house set above the pretty valley and vineyards. 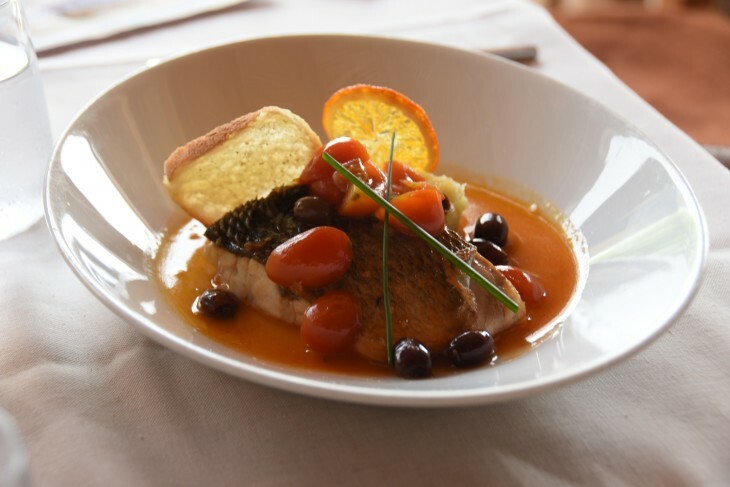 All the Delfina hotels offer a variety of excursions to local beauty spots, ancient towns and artisan shops. Above one of the many lighthouses that rise on spectacular spots. 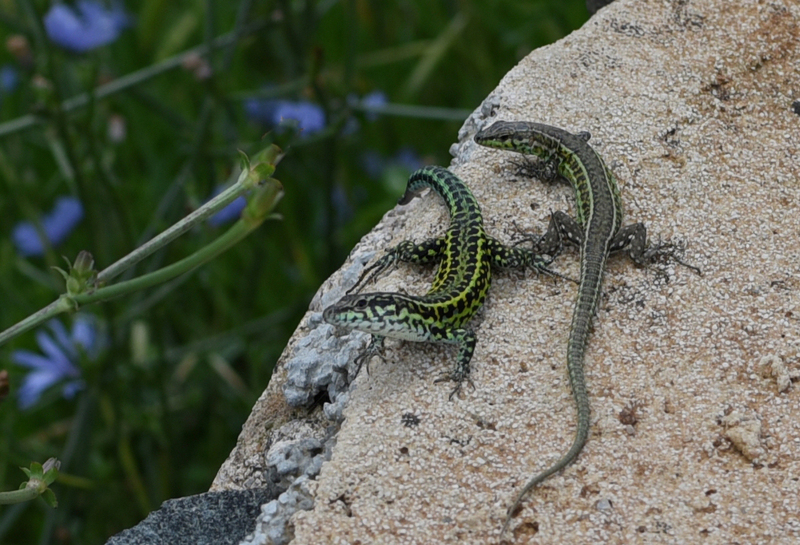 The Tyrrhenian Wall Lizard (Podarcis tiliguerta) is common on Sardinia. This little guy popped as I was trying to photograph his mate. I guess he thought his markings were more spectacular than hers. He was right. These lizards are far from fearless but if you approach very slowly you can get quite near before they disappear. 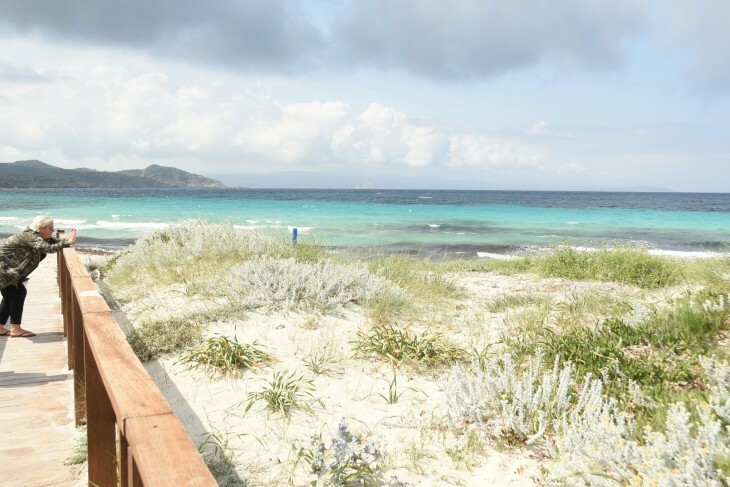 Nominated by Trivago as the Best Beachfront Hotel in Sardinia, Valle dell’Erica has two hotels, seven restaurants and five bars plus a lovely thalasso spa with natural seawater pools, hydro jets and open air massage. Boat excursions can be taken to the islands of the archipelago of La Maddalena and southern Corsica. But what really makes the difference are the staff, whose unfailing friendliness and constant helpfulness is something that you cannot train, it’s totally natural. Valle dell’Erica is located minutes from the ancient village of Santa Terese Gallura amid the National Park of the Archipelago of La Maddalena.The nearest airport Olbia is an hour’s transfer.